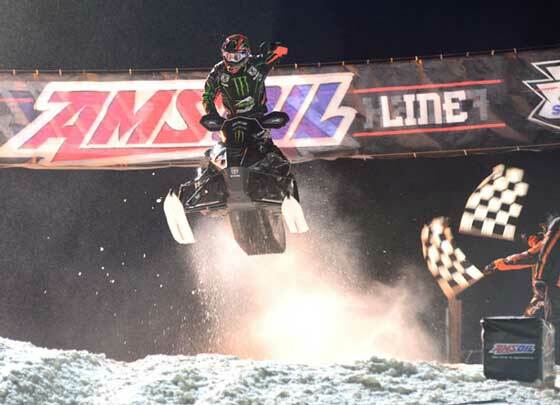 This past weekend in Bessemer, Michigan, at Rounds Three and Four of the ISOC National Snocross tour, Team Monster/Arctic Cat’s Tucker Hibbert returned to the top of the Pro class with emphatic victories in both finals. With something like a 32-second margin over second place on Friday and an 11-second margin on Saturday, Hibbert truly dominated the field. Afterwards I had the chance to ask him about it. AI: Awesome job in Bessemer! Tell me about the weekend. Hibbert: The weekend was amazing for us. I came into it pumped, prepared and with the expectation of winning. Every part of our program was more prepared than at Duluth. Other than messing up in one qualifying heat where I was leading, then came off and finished fourth, I won every time I hit the track. I had good starts, was fast and I really liked the technical and wide-open course. Winning here in Michigan last year was good, but this year was better. I felt a lot stronger and won by bigger margins with more control over everything. It feels more rewarding to win this year. Back in the trailer after the race there was a lot of smiling, high-fiving, drinking Monster, eating Hot Stuff and satisfaction for the team. We all stayed in one cabin during the weekend and after the race on Saturday we just hung out and enjoyed a meal together. It all felt good… a whole bunch better than Duluth. AI: My take on Duluth was that bad luck and the non-technical, holeshot-oriented course are what held you back. Do you agree? Hibbert: I mostly agree. 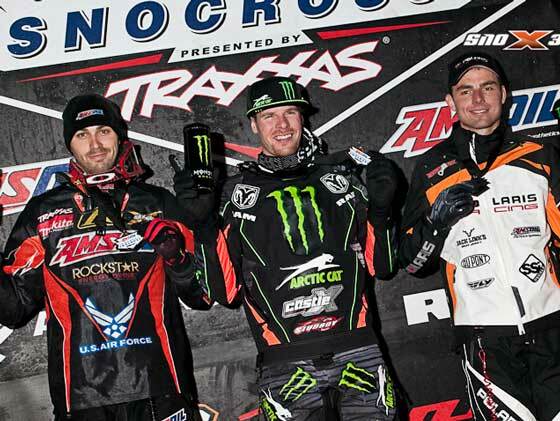 Duluth is always a small track, but this year it was smaller than normal. I felt fast on the track and was definitely capable of winning, but if you didn’t get the holeshot there was almost no room or good place to pass. What made it worse was that I didn’t put myself in a good position to win because of my mediocre starts. When you’re not up front, you get stuck behind, where you then get bumped around in situations where bad stuff happens. Like in the final on Sunday, I was in mid-pack on the first lap, my skis got run over and it bent my steering arm. But that’s my fault, rather than it being bad luck. Obviously some of the other guys do better on tracks like that, where I do better on more open, technical tracks. AI: What stuff did you and your team do in the two weeks between Duluth and Bessemer? Hibbert: Well I had more time to practice and ride, and we came into Bessemer far more prepared. After Duluth we tested for starts which helped me get better launches. We did a lot of analysis on my starts to figure them out and we made good progress, because this weekend I had a big holeshot in Saturday’s final and in a couple of the qualifiers. We also made gains in our suspension testing and now we have a better rear suspension setup. Mostly though the difference between Duluth and Michigan was a matter of seat time and getting everyone on the team on same page. Duluth is such a rat race. It’s a deadline that always comes quicker than we want it to. And so many details aren’t 100% complete. For Michigan we got those details buttoned up. Plus we learned a lot of things at Duluth. AI: Are holeshot-oriented, non-technical courses just going to be your big challenge now, or is there a plan to attack those too? Hibbert: We’ll get better. If we lined up at Duluth today we’d have better results. We will have tracks like Duluth again this year and we have to get better at them. 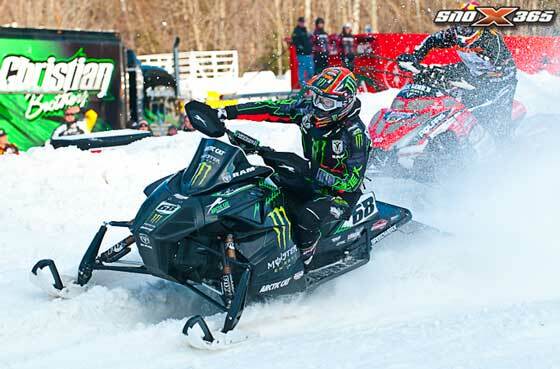 AI: How different is your sled now compared to Duluth? Hibbert: It’s not drastically different. Like I said, we made some… I’ll call them “minor” calibration changes to the rear suspension. We also made some clutching changes. Again, it was nothing drastic. I wouldn’t say we improved the sled a lot since Duluth, more just sorting it out. As a percentage, my sled was about 5% better than Duluth. 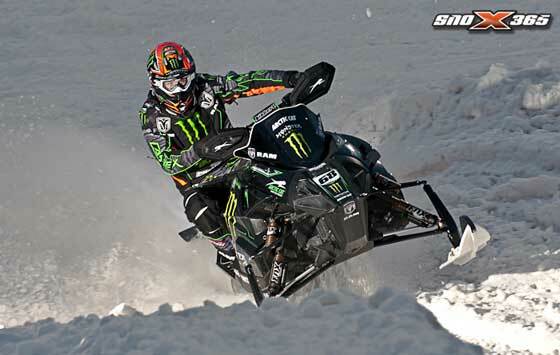 AI: Compare your new 2013 Arctic Cat Sno Pro 600 race sled to last year’s. Hibbert: It’s way better handling and performance wise. Probably 75% better. It has better brakes, is lighter, turns better and starts better. It feels a lot more comfortable. AI: You didn’t announce it beforehand, but in addition to the testing and such, you also spent a handful of days in Monte-Carlo, Monaco, between Duluth and Michigan. Tell me about that. Hibbert: Mandi and I went to Monaco for the FIM World Champions gala. FIM is the sanctioning body for various World Championship motorcycle events as well as the Snocross World Championships. Every year they have a banquet to honor the past year’s Champions. There were more than 40 motorcycle World Champions there. 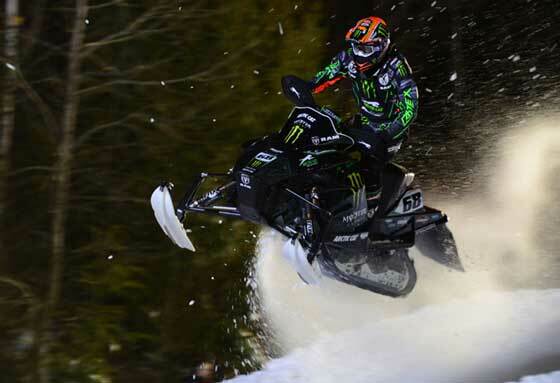 Snocross is the only non-motorcycle category, so I was there as the defending champion. The whole trip was pretty cool. We flew to France, went to the banquet, did the awards and came home. FIM is a very professional organization and it was an honor to be with the other champs. Obviously it wasn’t the best timing for me, but it’s the off-season for the motorcycle world. Looking back on the trip, it didn’t hurt me for the Michigan national. Despite the stress it’s always cool to travel overseas. We got to dress up in fancy clothes and do something different. We don’t get a lot of chances to do that stuff because we’re always racing. The highlight of event was hanging with motocross sidecar World Champion. His name is Daniel Willemsen and his partner, or “monkey” is Kenny Van Gaalen. Daniel is something like a 10-time World Champ and reminds me of my dad and Steve Houle, because he’s a racer-engineer. He’s gnarly strong, builds his own chassis and suspensions and is always thinking about racing. It was cool to hang out with him. AI: Your next race is Jan. 4-5 at Canterbury Park in Shakopee, Minn. What’s on your agenda between now and then? Hibbert: To get better, faster and stronger! We’ll be going wide open working on stuff. Plus we’ll start to make plans for the ESPN X Games to be prepared for that and the rest of the season. AI: Okay, back to Michigan… what was the most unusual or awkward thing that happened during the weekend? Hibbert: My dad slipped and fell and landed on Earl Reimer (laughs). From the sounds of it, he landed in Earl’s lap. I didn’t see it happen but a lot of people did and they all told me about it. The good news is that both Earl and Kirk are okay. AI: If I’m going to have some huge fall, Earl is definitely someone who’s strong enough to catch me. On the other hand, he’s so gnarly strong he’d probably break me in half. Hibbert: I think it’s funny that even though there’s still a new crop of racers, after all these years it’s still my dad and Earl who are mixing it up. AI: For sure. Thanks for chatting. Hibbert: Cool, thank you too. he was flying at blackjack. nobody has an answer for that. Very Good interview ! 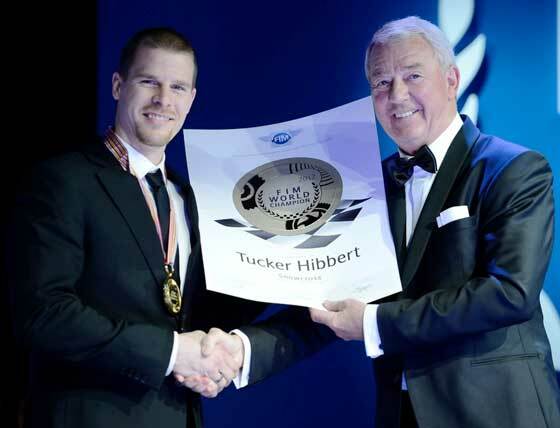 Good on Ya Tucker for representing North America at the FIM Awards and races ! I have never herd of Hayden Norris, Kay Norris or Phil Norris. Are they freestyle riders?